Before the local elections on 5 June 2009, I had the obligatory door-to-door visit from a local politician. I came away from the interaction wondering about the term local. For the politician, the word local is the keynote of their spin. Local means a focus on your concerns within your locality. He/ she is here for you, your perspective, your landscape, and your ideals. If you have something to say, they are your voice. The local politician usually advertises their roots as part of their campaign: "born in the area". This means that they understand the nature of your concerns and troubles. They are just like you. But, are they? Is there such a thing as being local? Has the term local lost its way by virtue of our ever-expanding view of the global? The following text is an exploration of this notion of the local and the human aspiration to get to a centre of influence in order to be the centre of attention. The theoretical backdrop to this discussion is Nicolas Bourriaud's term the radicant, the ‘vegetable' protagonist of the French curator-critic's new Altermodern thesis. The radicant is the artist as transient, without roots or the responsibility to adhere to their ‘localness' (a case in point is the English artist Liam Gillick, who is representing Germany at this years Venice Biennale, and not to forget Bourriaud's 2009 Tate Triennial, which for the first time this year had non- British artists included under the criteria ‘Passing through'). From the root of Bourriaud's radicant the discussion will look at the current political landscape as an example of how, even from the margins, we think we can influence something at the centre (the June 2009 local elections were generally looked at as a potential ‘forcing out' of the current government, by way of a Fine Gael majority on a local level, and so a no-confidence vote and a hurried general election). Another instance, which highlights the importance of being at the centre and the fear of being allocated to the periphery, was in 2006, when NCAD was faced with the prospect of being uprooted from Dublin city centre to Dublin 4. This proposed move to UCD would have changed the politics of the centre in relation to who held the position of attention in visual-arts education in Ireland. Another centre of influence is the art market. For example, the Frieze art fair funded a project space - Frieze projects - that is part of the fair with aspirations of distancing itself from art-market politics. How does a legitimate art-project space, that is part of and parceled by the art fair itself, distance itself from market politics which are at the centre of the art fair, but also create a significant gap between the market and itself to influence something more sustainable than the fickle forecasts of the fair? And finally, there's this years Venice Biennale and the collateral events that aspire to gain attention through theatricality or the ‘wow factor'. What lengths will the artist go to in order to open the doors to success, financial or otherwise? At a time of economic and political uncertainty the politician becomes a shapeshifter; they morph. Today, the face of politics shifts to the face of the bank. Depending on the individual's perspective, from either a local or global gaze, the untrustworthy face shifts to either your neighbor, or the face that is current in the media. For example, in our recent past the centre was represented by George W Bush and America. The centre sometimes can be a monstrous place. It is a place where power is given and taken away. The fear of losing power, more often than not, creates a fence for the insecure individual at the centre to perch on. Being caught between is a contemporary concept. Artists are always going on about in betweenness; ambiguity is an antidote for the dead-end question. If the fence is a place were politicians and concepts perch, where do we situate ourselves in order to influence and gain power? In the context of this discussion, where does power reside for the artist? Is location the end-all: the periphery versus the centre, the rural versus the urban, the culchie versus the jackeen? Bourriaud asks: "So the global imagination is dominated by flexibility?" Being local, or ‘localness' can also be seen as not being flexible, unable to change. This inability to change reminds one of the Star Trek character that partly influenced Alan Phelan's Barbara's boy. Phelan's portrait of the tragic shape-shifter, Odo, catches the changeling in mid-flux. It is a portrait of the character's inability to perfect his shape-shifting abilities. The back-story to the character reveals that Odo does not know anything about his origins. So the alien coincidently becomes a space explorer, searching for his home so he can refine his potential ability to change properly. Odo has the flexibility but lacks the knowledge that will allow him to change. Or is it all a case of environment? The shapeshifter has been displaced from his own environment. His ‘localness' has been taken from him. He is a tourist. He lacks the knowledge to change, and so lacks power. In the end, he wants to get back his ‘localness'. In 2006, NCAD was about to be uprooted from a centre of influence to a periphery of influence. How would that proposed move from Thomas Street, Dublin city, to UCD on the outskirts of the city have affected NCAD as an institution? With Dún Laoghaire Institute of Art, Design and Technology down the road, there would have been an inevitable bumping of heads. NCAD's location is why it stands at the fore of art education in Ireland. Gradcam, a recent initiative that facilitates postgraduate study across several art institutes in Dublin and Belfast, could never have existed anywhere else. NCAD has always received the most attention when it comes to the showcasing of its students' wares at the end-of-year degree shows. The college is blessed with its location from a sociological as well as political standpoint. Curators, art critics and the market are not good travelers. They are not the "urban wanderers" that Bourriaud speaks of. So all in all, NCAD is the jewel in the crown of the art-head. It is once again in the realm of Star Trek to predict the fallout of such an uprooting. However, oblige me to consider a prediction in the vein of Bourriaud. For instance, let us take as a starting point, the public arts centre. Usually located on the periphery, the arts centre is acknowledged as a space that is for the local, just like the aforementioned politician. Funding and support are dealt out with the local card in hand. In the initial stages, the arts centre starts small, having local submissions and education events. However, in time, the arts centre begins to expand outward, inviting curators and artists from outside the local area to exhibit. A more ambitious program pops up every year and the arts centre becomes a desirable site for more established artists to exhibit. Local events still occur, but the real impetus is on showing art from the periphery or centre, depending on where you are standing. Now let us take NCAD Gallery, a hybrid mesh of public arts centre, gallery, and educational space. Generally, the arts centre or gallery have one or two curators, or a board, that pull the strings. However, with NCAD there is the problem of departmental politics. NCAD is still very much a traditional art college. Other institutes have a more dispersed outlook when it comes to department logistics. NCAD on the other hand has a finite vision on the idea of the department: Painting goes here, Print goes there, Media up here and Sculpture over there, and never the four should meet, or worse still, cross over. When it comes to the gallery and the board that controls the input and output of the space, the decisions must suffer from departmental turf-war. It is a leap to put an uprooting of an institution in the same category as the nomadic radicant artist, but let's leap just for the sake of science fiction. "Stagnation as an ideal" is something that establishments perpetually grapple with, due to a juggling of power between the bit-parts that make up an institution. Of course, there is the issue of money. Funding may be more forthcoming when a less finite discipline (such as Fine Art), that needs to create ‘New Knowledge', is attached to a bigger multi-disciplinary campus. Significantly, art courses in the American educational system, which are more often than not bit-parts of multidisciplinary institutions, have fared well in this structure. Columbia, Yale and MIT visual-arts programs are examples of art courses existing as part of a bigger institution. ‘The sum is greater than its individual parts' is a truism that fits this equation. Gradcam, which is indirectly part of NCAD, reflects this truism in how it merges different disciplines under the broad terms ‘Creative Arts & Media'. This maybe an example of a ‘bit-part' knocking at the door to the centre of influence, or breaking away from the centre to create a new centre of interest. As an art student at the time of experiencing Nelson's Project, I found that, for the briefest of moments, it overshadowed the usual talk of money and trends that follow the art fair. What is key in Nelson's project is the title, Mirror infill. I assume that Nelson did not expect his work to exist outside the market through its criticality of the fair's crowded white walls and display lighting. 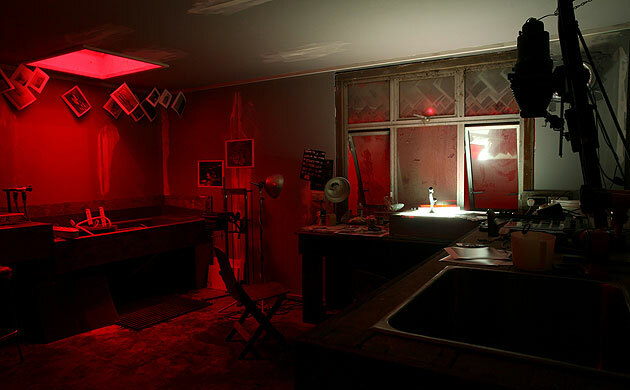 In a way, his work, which existed as a hidden darkroom within and around the fair, put the fair in bigger and brighter lights, and highlighted the position of art in relation to the market - to the point that the fair reflects back with greater force, showing up Nelson's project as a juvenile distraction. So for that moment in time, I experienced an interruption at a centre of influential consumerism. Considering the power that the art market wields, this was a significant achievement. Two years later, the New York-based artist Cory Arcangel did the opposite, but it seems, with the same outcome. If Nelson's project acted as a dark reflection of the fair, a type of doppelgänger, on the margins, striving for the centre of attention but in the end only reflecting a dark twin, Arcangel's project was a one-liner that, like Nelson, was not a protest or affront to the goings-on at the art fair but an acceptance of the procedure that underlies the market. Arcangel gave an opportunity for one gallery that did not make it through the Frieze art selection process, to get the Golden Ticket, literally, and show at the fair. If you believe what you read, power and authority seem to revolve around this notion of centrality. The artist and critic Melanie Gilligan describes her own position in the art world as keeping one foot in the art world and "keeping one foot on the ground, in other interests." This other foot that she speaks of is placed firmly in the contemporary financial markets. It is this distance and other interest that gives her criticism an off-the-fence acuity. This "reigning market logic of equivalence" that Gilligan speaks of could be ascribed to the art fair, situated firmly at the centre of the art world. What you could only describe as a collateral event, Frieze projects, can only aspire to interrupt the market for the briefest of moments. However, Frieze projects can be looked at as a success, not to be measured in time but by the ‘hick-up,' that this interruption causes in what Gilligan describes as a "frictionless market." It is not surprising that Gopnik says, "And he is only on the periphery." Gaining attention from the periphery is an anomaly. But when anomalies occur, they do not go unnoticed. Gerrard's future show at the Hirshhorn, Washington DC, at the end of the year is a testament to location not being the end-all. There is a fraction of a moment that separates rising and sinking. Some people call it luck, others hubris. One of Jean-Michel Basquiat's memorable quips on a canvas from the mid-1980s was, "most of the bums in the Bowery were bankers." The Bowery in New York was an area that was defined by homelessness, especially in the 1970s and ‘80s. Ironically, Basquiat would later see himself displaced in a similar way, but from the streets to the upper echelons of society. Positions in society are not static, they grow or recede. In 2006, NCAD's stable position at the fore of art education in Ireland was compromised. Such an uprooting would have caused a rupture in how things had worked up to 2006 in the Irish art world. NCAD would have been pushing up daisies out at Dublin 4. I say this based on the conclusion that there has to be something to lose for politics to exist in such a unstable form at the centre. And without the politics and power games that occur at the centre of influence, ‘stagnation as an ideal' would inevitably win over. Maybe it is not a jump to put an uprooting of an institution in the same category as Bourriaud's nomadic radicant. Why not look at the shapeshifting politics at the centre of influence as a constant reshuffling of positions in order to avoid ‘stagnation as an ideal'. Nicolas Bourriaud, 2009. The Radicant. New York and Berlin: Sternberg. ‘Radicals and radicants', pp 44-60.